Muscle atrophy is a medical condition in which the mass of muscles deteriorates, sometimes in localized areas and other times affecting multiple. Signs of muscle atrophy in dogs include depression, lethargy, paw dragging, weakness, lameness, and noticeably thinning muscles. It is commonly seen in geriatric canines or dogs who suffered injury and were on crate-rest for an extended amount of time. But there are several other causes for the this condition, so here's everything you need to know about muscle atrophy in dogs. Understanding and pinpointing the exact cause of muscle atrophy in dogs may help owners in preventing or treating this condition more quickly with better results. Here are the possible most common causes of dog muscle atrophy. Common signs of aging in dogs will include the graying of their coat, particularly around the dog's eyes and snout, cloudy vision, weight gain, a coarser coat, and weakening muscles among other signs. Muscle mass and muscle tone of the dog will inevitably wain (condition called Sarcopenia) and in this instance canine muscle atrophy isn’t so much a worrisome health condition as is a part of the natural process of the dog aging (Pagano, et al; 2015). However, there are several other leading causes of muscle wasting and muscle atrophy in dogs which could prove more problematic, especially if the pet is experiencing them in earlier years. While weight gain is more probable in old age, today more veterinarians are seeing young canines suffering from the nutritional disease well known to us as (pet) obesity. The heavier the dog, the more likely they are to develop a multitude of illnesses and conditions, including canine muscle atrophy. Excessive weight can put a damper on your dog’s general mental and physical health as well as strain their joints, which over the years, could lead to more severe issues, such as arthritis (Impellizeri et al; 2000). Arthritis may become an issue for any canine but is most common in larger breeds who tend to bear more weight on their joints, slowly deteriorating them over time. While muscle atrophy in dogs affects the muscles and arthritis affects the joints, they can be related as the painful strain caused by weakening joints ultimately leads to a lack of full range of movement for the pet (Cuervo, et al; 2014). Canine arthritis is known to displace the work of dog's muscles, thus causing some muscles to overcompensate while others are utilized less, if at all. This takes the form of limping and can slowly lead to eventual muscle atrophy in dogs. Within a dog's lifestyle that’s lacking in daily exercise, muscles will begin to fade as they’re not being purposefully or routinely utilized. A dog may show a disinterest in playtime or walks for a variety of reasons, both mental and/or physical. Studies show that the animal might be depressed if they’re left alone at home or in a confined space for a majority of the day; they could be responding to stress as a result of a recent re-homing, loss of family member, or the introduction of a new pet to the home (Wemelsfelder, 1993). Additionally, physical ailments will cause an animal to refrain from being active, typically this will be an injury of some kind which makes movement uncomfortable, which will eventually result in progressive muscle atrophy in dogs. Another common ailment of senior dogs, and larger or overweight pets is hip dysplasia which can also cause canine muscle atrophy. The hip joint is made up of the femur and pelvis and together they create a fluid, “ball in socket” motion, allowing our pets to run and play without issue. However, with hip dysplasia, this fluid motion is replaced with a grinding which eventually erodes the hip joint (Freeman, 2011). There are different levels of severity for muscle atrophy in dogs related to hip dysplasia condition. With some there may be a shallow hip socket, a semi-displaced femoral head, or a complete dislocation. Often this condition is inherited or part of the genetic make-up of the dog (Cuervo, et al; 2014). Hypothyroidism equates to an underactive thyroid. Dogs can also be affected by an overactive thyroid which is coined hyperthyroidism in dogs; however, it is not common and in the veterinary field is typically linked to cancer in dogs (Peterson; Merck Vet). The thyroid is a small, yet important gland as it controls the metabolism of the body. During hypothyroidism the immune system mistakes the dog's thyroid gland for an invader, and treating it as a foreign, unwelcome guest, chooses to attack it. Among signs that show a weakening immune system (such as dog's severe shedding and vulnerability to illnesses and infections), a canine with hypothyroidism will also gain weight, experience a lowered heart rate, and thus have a waning interest in activity. As previously discussed, decreased exercise and weight gain are big contributors to muscle weakening, deterioration and muscle atrophy in dogs. There’s not always a lot to be done to prevent medical conditions in dogs from occurring. However, with an active routine and nutritional diet, a dog’s chances of developing muscle atrophy can be greatly decreased. This can be done by addressing both, muscle atrophy in dogs directly, and potential causes of it discussed above. Here's what you can do. Dogs love and need activity. Not only does it keep them healthy and mentally happy, but it’s also proven that a well-exercised dog is a better-behaved dog. Boredom and lack of an energy outlet may cause dogs to bark excessively, chew up your favorite pair of shoes, or get into the trash can among other problems (Wemelsfelder, 1993). Regular exercise doesn’t just help keep your dogs entertained and out of trouble, it also helps with their physical health by keeping them in shape and building their muscles. Exercise doesn’t have to mean high-endurance jogs or 10-mile hikes through rugged terrain and gained elevation; it can be something as simple as a 15 to 20-minute walk per day or a game of fetch in the back yard. Even senior dogs or dogs suffering from arthritis need routine activity to help them build strength and practice flexibility, which minimize joint pain and fatigue, reduces risks of muscle atrophy in dogs. As your dog’s owner, you are their biggest (and sometimes only) advocate. Since they’re unable to communicate with us, it’s our job to pay attention to their general health by acknowledging any changes in their behavior, routine, or gait. Even when your dog isn’t experiencing or showing signs of pain or discomfort, research shows how routine visits to the veterinarian will ensure you are one step ahead of any potential health hazards. The minimum recommended amount of vet visits for a healthy dog is every 6 months. An obvious one that doesn't require much explanation – a good diet adjusted specifically for your dog and their condition(s). There are a few ways you can monitor your pet’s health by their diet: purchase safe, health-promoting dry food and top rated brands, cook homemade dog food meals for your pup yourself, or use a combination of both. Another key to a balanced diet is to not overfeed. Remember to always discuss any major changes to your pet’s diet with a veterinarian before doing so. Even trying a new brand of kibble can upset a dog’s stomach if their body has grown used to a specific meal. To prevent muscle atrophy in dogs, a well-balanced diet looks a lot like what you may eat when you’re on a health kick. While dogs do not require variety in their diet to entertain their taste buds, there are certain cases where pet owners might need to change things up once in a while. Allergies and health conditions is one of the main reasons to do so. Pure proteins, such as beef, chicken, and fish are great for building muscles in dogs (in general, pork is fine too, but not recommended for a raw diet). Healthy oils and fats such as coconut oil are a great addition to your dog’s diet as well, with the added bonus that it helps promote hydrated skin and a healthy coat. Dark, leafy greens – the darker the better – is another wonderful resource as dogs’ bodies crave vitamins as much as they crave protein and fat from meat. While most carbohydrate sources should be avoided, there are certain vegetables and fruits that have been scientifically proven to improve dog's health, and thus may help with muscle atrophy in dogs. Sweet potatoes and pumpkin puree are two examples of safe, nutritional carbs and fiber that will add more variety to the diet (pumpkin is great for dog's digestive health too). A couple of the supplements proven most effective and beneficial to dogs with or at risk of muscle atrophy are Omega-3 fatty acids and a range of antioxidants. While fatty acids are saturated in fish protein, they also come in dog-friendly pills or fish oil bottles. Vitamins can be given to dogs in pill form, but just as is the case with humans, it's best to feed them through food, either your dog's kibble or natural veggies and fruits. Many berries, such as blueberries and raspberries, are full of antioxidants, are safe and delicious for dogs, and have been scientifically proven to improve canine health. If it’s not within your budget to feed your pet two meals of whole chicken breast, sautéed spinach, and pureed sweet potatoes every day using homemade dog food recipes we often share here, then supplement your pup's diet by doing one prepped meal and one kibble meal a day. A recent study found that 1 in 3 of American dogs are overweight, and although the statistic is bleak, it’s good news for you because it means there are plenty of options for weight control dog foods on the market. There's a number of weight loss dog food brands available, but you can also pick regular brands and check the ingredients list and count calories for your dog. Remember that dog food brands that claim “healthy”, “organic” or “weight management” can have additives not recommended to a pet with weight, joint or muscle atrophy in dogs issues. Common sense will tell you to avoid high caloric foods and wheat gluten, corn gluten, color dyes, and chemical preservatives (BHA, BHT). These synthetic ingredients have been linked to causing weight gain and/or kidney issues. Slow feeder bowls are an excellent resource, not just to owners of overweight dogs, but to anyone making an effort to ensure their dog is healthy and stays that way. They can also assist in dealing with muscle atrophy in dogs. What a slow feeding bowl looks like. A slow feeding bowl is generally inexpensive and can be found online or at a local pet supply store. They come in a variety of sizes, making them perfect for any dog from a Chihuahua to a Great Dane, and monitor a dog’s eating habits and meal size. There are also several game or play related feeders, many of which are designed by KONG brand. A number of KONG devices can be stuffed with any tasty treats (peanut butter, shredded chicken, kibble or low calorie treats) forcing your pets to work for their food. 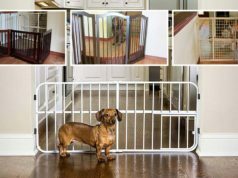 This is not only mentally challenging and fun for the dog, but it also can ensure the dogs aren’t overeating or eating too quickly. Thus what’s a treat-filled toy for them is a health-managing blessing to you. This is often overlooked by pet owners dealing with muscle atrophy in dogs, but how and where your dog lays can have a long-term effect on their joints, muscle and related health conditions. Orthopedic dog beds will keep your pet comfortable but also lower their overall risk of developing a health condition that could cause muscle atrophy. These beds require less pressure and stress on their joints and muscles than lying on a hard surface like the ground or kennel floor. Because muscle atrophy in dogs is the result of several different health conditions, treatments will often vary. Several treatment plans may include a combination of any of the following and all will do nothing but benefit your dog’s muscle and joint health. This ideal for breeds that love water, such as Labradors, who were specifically bred to have webbed feet, making them natural and excellent doggie-paddlers. Aquatic therapy, or hydrotherapy, has scientifically proven benefits for dogs (Houlding, 2011; Waining, et al. 2011). 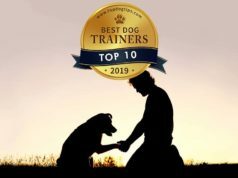 This is something you can set up with an animal chiropractor but with some basic knowledge of safe practices and helpful exercises, it’s also an activity you and your dog can explore together, without the guidance of a professional. According to veterinarians, this is one of the most effective ways to deal with pain and muscle atrophy in dogs. A regular or dog pool, ocean or lake are wonderful resources to overweight and senior dogs as well as dogs who are in recovery from a surgery because they offer a weightless environment for the pup to move, have fun, and best of all, keep their muscles and joins in motion with little pain. A common veterinary-prescribed treatment for animals suffering from arthritis, Adequan for canines is an FDA-approved injectable serum that improves joint health, acts as pain relief, as well as combats arthritis by attacking cartilage-wearing enzymes. It's commonly recommended by veterinarians as a series of injections that typically take place over the course of 6 to 8 weeks with the dog experiencing mild side effects, such as diarrhea and irritation at the injection site. There are numerous benefits to massaging your dog according to experts, especially when experiencing muscle atrophy in dogs and/or general pain. When canine's muscles are targeted and given the right amount of pressure while massaged, tendons and ligaments relax, and blood flow is increased. As part of physical therapy, massage has been proven to relieve pain and help with dog's recovery (Mills, et al. 2015; Fredrik, et al. 2006). Pet massage for dogs with muscle atrophy. There's a number of methods to massage your pet, but always check with a veterinarian before trying to be your dog's personal masseuse. Some health conditions like muscle atrophy in dogs, or particularly those associated with joints or muscles, require gentle or no pressure to the area in question. It might be better to use a professional. In addition to the daily vitamins and supplements that act as preventative care for muscle atrophy in dogs, your veterinarian may also suggest natural anti-inflammatories, such as turmeric-based pills as well as pain relievers, to aid in muscle atrophy treatment. These are meant to help with any pain your pet may be experiencing due to the dog muscle atrophy condition and therefore possibly inspire them to be more active which in turn helps combat their weakening muscles. Other supplements may include those often given for arthritis which aid in cartilage repair and strength such as Glucosamine (with Chondroitin) or even muscle building additives such as whey protein for dogs. Recently, there's been more research done on muscle atrophy in dogs, and new supplements are coming into light. Most recent news was the supplement called MYOS Canine Muscle Formula, announced in June 2018, that has been shown to effectively treat muscle atrophy in dogs specifically. This is the first of it's kind. Other than pet message, a veterinarian may recommend physical therapy intended to help both joints and muscles and send you home with a few exercises to do with your pet. This is likely to be one of the more effective ways to treat muscle atrophy in dogs and any related conditions such as arthritis and post-surgery recovery. Physical therapy for dogs with muscle atrophy. Passive range of motion movements are best performed while your canine companion is in a relaxed state and position – on their side, laying down. These exercises will involve you bracing an upper joint while gently and slowly moving a lower one. For instance, if the dog's muscle atrophy was occurring in the right leg, you would have your Fido lay on their left side and gingerly extend their right leg out and in (like in the picture above), for a few reps, sometimes holding it out in the extended position for several seconds. When performed two to three times a day, this form of physical therapy has proven very helpful to canine patients suffering from joint and muscle weakening (Mills, et al. 2015; Fredrik, et al. 2006). The last on the list of dog muscle atrophy treatments is something completely new on the veterinarians' radar that's soon to be available but isn't yet – gene therapy for dogs. Most recent studies have shown how scientists at UW Medicine Institute for Stem Cell and Regenerative Medicine used single infusion to restore dog's strength and to prolong affected canines' lives. This might be one of the most effective and promising treatments for muscle atrophy in dogs but we'll have to wait a little longer for it.